On March 6th, H.E. 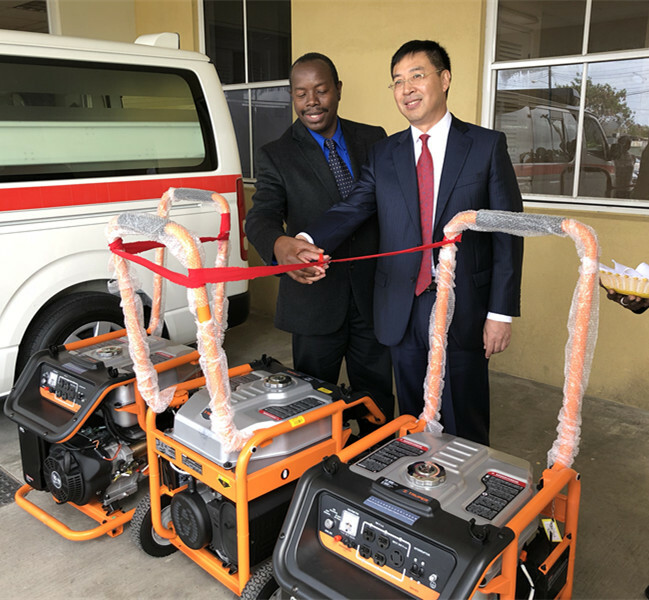 Yan Xiusheng, the Ambassador of the People’s Republic of China to Barbados attended the handing-over ceremony for the equipment donated to the Barbados Red Cross by the Chinese Embassy in Barbados. Mr. Zou Xi, Political Counsellor of the Chinese Embassy and Mr. Winston Waithe, President of the Barbados Red Cross Society attended the ceremony. Ambassador Yan expressed at the ceremony that Chinese President H.E. Xi Jinping pointed out clearly in the report to the 19th National Congress of the Communist Party of China that it is the Party’s abiding mission to make new and greater contribution for mankind. The aim of China’s diplomacy with Chinese characteristics is to build a new type of international relations and to build a community with a shared future for mankind. The Chinese Embassy in Barbados stands ready to take the role as a bridge to increase the exchanges between the Red Cross of China and Barbados so as to promote the friendly cooperation between the two countries and the development of the international humanitarian work. President Waithe sincerely thanked the Chinese Embassy in Barbados for the generous donation and expressed that this donation will help improve the ability of the Barbados Red Cross Society towards emergency response and rescue work especially for the upcoming active hurricane season. The Barbados Red Cross Society is willing to deepen the cooperation not only with the Chinese Embassy in Barbados but also with the Chinese Red Cross to make more contributions to the development of the two countries’ Red Cross work. Before the handing-over ceremony, Ambassador Yan visited the Barbados Red Cross Society’s headquarters and exchanged views on the future cooperation with President Waithe. The Caribbean Broadcasting Corporation, the Nation, the Advocate and other local media made reports on the ceremony.